In Europe, the main competing exterior water tanks are in Malta and in Alicante, Spain. Malta's facility has the edge over all other similar tank facilities. This is mainly because they have been around for nearly 50 years and therefore the facility has extensive experience in water SFX, scale-model making, boat building and general set construction. Malta's Shallow Tank is unique for its natural horizon. 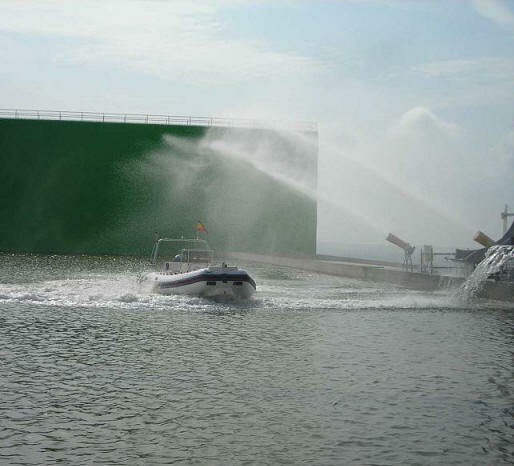 Alicante has one water tank with a green-screen backdrop instead of the natural horizon that the Malta tanks boast. However, Alicante boasts of several state-of-the-art sound stages. Malta has one stage (50 x100ft and 36ft high) which is not sound-proofed but as it is situated in a quiet environment this is usually not an issue. Both tanks are surrounded by a variety of interesting locations. Producers are often faced with the dilemma about which tank facility is the most suitable for their production. There is no simple answer since this depends entirely on the nature of the project and variables. From a budget perspective, the total bottom-line costs for filming at both facilities may become equally competitive when also calculating the non-facility costs such as travel and accommodation. Whilst the Malta tank charges are more expensive than Alicante's, producers filming in Alicante have additional travel costs for the majority of the crew who unfortunately do not exist locally. Malta also has some crew shortages but one can generally expect a minimum of 40% of the crew to be Maltese. When the industry is quiet this figure can rise to as high as 75%. It is also worth noting that Malta's "Shallow Tank", which can be best compared to Alicante's tank for the similar shape and use of SFX, is nearly 40% larger in surface area then its Spanish counterpart. Furthermore Malta's "Deep Tank", which is oval shaped and 36 feet in depth, cannot be compared to any other tank in the world since it is unique in size and shape. But if your tank work is not overly demanding or elaborate, Alicante's tank could be satisfactory enough, especially if you need more than one sound stage nearby. Alicante is also surrounded by long stretches of beach locations as opposed to Malta's shorter beaches. One advantage to filming at sea in Malta is that productions can have alternative bases and locations depending on the direction of the wind. When one side of the island has strong winds, the wind on the other side is usually more subdued and easier to operate in. This convenience of having a back up plan does not exist when shooting at sea on the Spanish coast along the Valencian region. A budget analysis conducted by the PCP in 2011 for a simple one-day commercial shoot showed that both options would virtually cost almost the same. However if one factors in the Maltese government's cash rebate for cinema and TV films or series (advertising shoots excluded), the costs in Malta could potentially be lower then Spain's. Although Alicante promotes financial incentives, the system set up by the Valencian region is not automatic for every foreign shoot and it is known to be very bureaucratic. What sort of locations are being sought, if any? What are the distances between the locations and can lengthy company moves be afforded? How many cover sets are needed and how large are they? Is there a requirement for specialized construction such as model making or boat building? What is the timeline? What type of water SFX is required? How many tank-days vs stage or location days? What is the size of the crew? Is the film CGI-heavy in the tank, requiring more green-screen shots then those requiring natural horizons? For further consultation on this matter, you may contact us here.